Note: All of this music was recorded outdoors on basic equipment in “real life” circumstances, under conditions far from optimal for recording. Yet the ambience, excitement, and electricity of the music shine through in ways that fully reflect its cultural authenticity. It is to provide a small cultural looking glass into a world or worlds barely known to most of us that these recordings are presented. I hope they will encourage you to want to know more, to open your world up more to the many fascinating and diverse worlds around us. Group One plays large single-row panpipes of seven different-length tubes each. Pieces 1 and 2 were recorded on the group’s arrival and departure from the small courtyard. Group Two plays 5-hole straight flutes, each some 2 feet long. Piece 3 was recorded on their arrival in the small courtyard. Group Three plays two sizes of 4-hole straight flutes, one approximately 2 feet long and the other closer to 3 feet. Piece 4 was recorded on their arrival in the small courtyard. Group Four plays relatively small single-row panpipes of different sizes with different-length tubes in groups of 6, 9, and 12. Piece 6 was recorded on the hill overlooking the town, as were all of the remaining pieces featuring all of the different groups. Various types of drums and snare drums of all shapes and sizes can be heard prominently featured on all of these recordings. The village of Italaque is set alongside a river in a high Andean valley some two to three thousand feet below the Bolivian altiplano (or “high plane”), itself some 12,500 feet above sea level. It is 25 kilometers northeast of Puerto Acosta, not far from the Peruvian border, on the eastern (and less-visited) side of Lake Titicaca. It is reached via an occasional (all day) truck ride from La Paz or by a seven to eight-hour foot path from Puerto Acosta, which is the way I and an Australian friend of mine, Patrick Hanson, arrived. 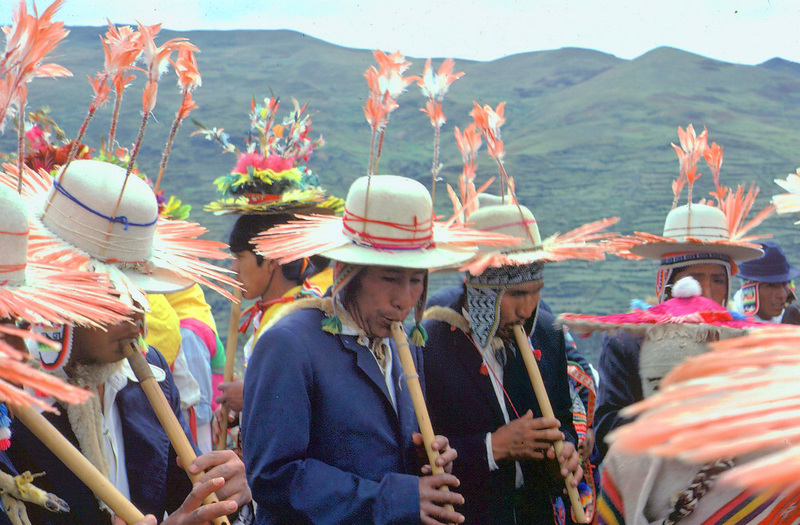 The native people of the region are Aymara-speaking, and for the feast of the “Discovery of the Holy Cross,” May 3, groups of musicians came to Italaque from several area villages to take part in religious and ritual observances. 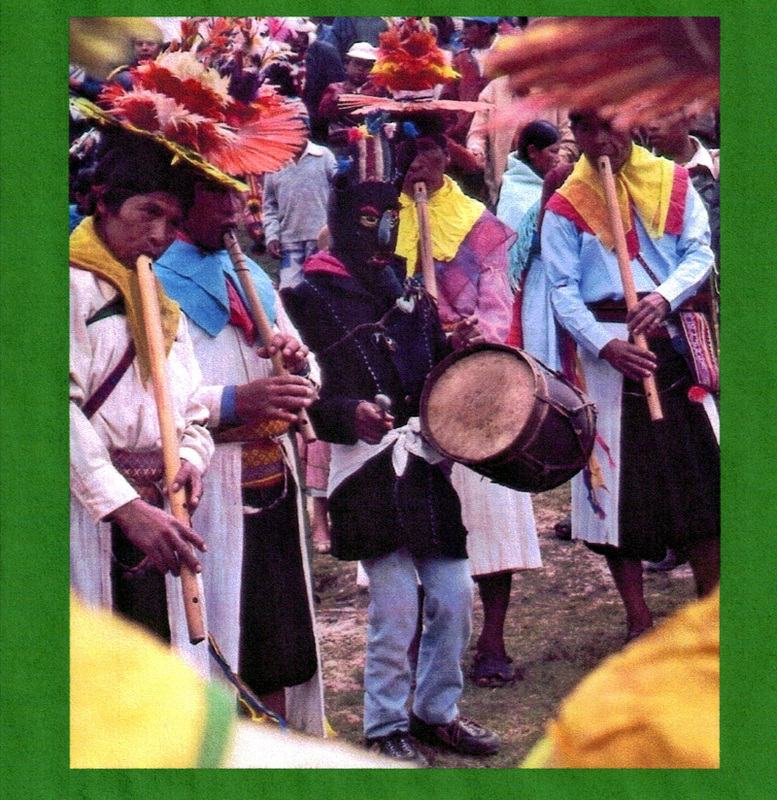 In Lynn Meisch’s Guide to El Dorado and the Inca Empire, where I first learned of this festival, she refers to the goings-on as a contest of sorts among groups of sikuri (zampona or panpipe) players previously trained in Italaque, but this seems to no longer be the case. At least in 1986, there were only two groups of sikuris— one played quite large panpipes and the other from Italaque played smaller ones— and there were three other groups which played straight wood (bamboo) flutes of varying types and sizes. Although the several groups frequently played their own music at the same time right next to each other, there was no apparent competition between them, at least none that was apparent to an un-acculturated outside observer. Rather, there was only a dizzying and outrageous mix of sound, of varying sorts and in varying chance combinations, never the same twice! The festival took place on a high hill and precipice that overlooks the town. The hill, known as Calvario, was the site of a very small chapel and courtyard. Early in the day, each of five musical groups (except for the one from Italaque, the event’s organizers) took a place somewhere on the hillside below, performing their own ritual observances (including the drinking of an overpoweringly strong white grape brandy which they continued drinking intermittently throughout the day) and preparing themselves for the hours of playing to come. One by one, they moved rapidly up the hill, playing their panpipes, flutes and drums. Ritual prayers and playing took place in the small courtyard and chapel, the groups forming circularly and moving circularly, first this way and then that, as they played. They then filed out onto the precipice of the hill where they continued to play, with only short breaks, the remainder of the day. Each of the groups was composed of some fifteen to twenty-five male musicians. They were dressed in different, though similar, costumes, presenting an array of colors. Some wore hats decorated with numbers of tall multi-hued feathers. One group used only flamingo feathers, making for a sea of soft pink. Two of the groups wore as well a type of “woman’s” wig, straight black hair pulled back with a single thick braid behind! The group with the flamingo feathers wore a type of open-front, thin white cassock, nearly dress-like at the bottom, on top of which they wore dark blue suit coats. By way of difference, the group from Italaque wore suits (or coats) and occasionally ties, and dress hats (! ), while still another group wore the white cassocks, but without the coats, almost “oriental” looking. Indeed, some of the music itself (tracks 3 and 4 e.g.) had a quality, an elegance even, not unlike a type of Japanese or Korean court music — highly stylized, insistent, and nearly trance-like in nature — music, like all of the music heard here, from a dimension far removed from itself as music alone. For here, unlike most native festivals, the music was the main event, it was not an accompaniment to anything other than itself. Its only connection to any ritual outside of itself was that it was this day of ritual that had brought it into being and it was responsible to it, but the music was played and entered into on its own terms. In the first instance, this was a musician’s festival. The groups were, however, accompanied by various mythological and ritual characters. There were two men costumed in huge black-and-white condor feathers wearing a type of hood over the face with a small, rectangular mirror in the center, representing perhaps Inti, the sun, and also perhaps to ward off evil influences. There were other characters, more like “ritual humorists” (I borrow the term from Victoria Bricker who used it in Ritual Humor in Highland Chiapas, University of Texas Press): a couple of masked and hooded personages with a type of ski-mask over their faces, devilish sorts with short rope whips and small bells (heard at various points in the recordings). The function of the “ritual humorist” is to add a certain levity, to poke fun at participants and bystanders, to alleviate or contradict the serious nature or thrust of any event and, frequently, to reinforce (by contrast) accepted community values. These types of characters are common at native festivals throughout the Americas.